The wealth of petroleum has made the Middle East one of the most actively explored regions of the world. The volume of geological, geophysical and geochemical data collected by the petroleum industry in recent decades is enormous. The Middle East may be a unique region in the world where the volume of subsurface data and information exceeds that based on surface outcrop. 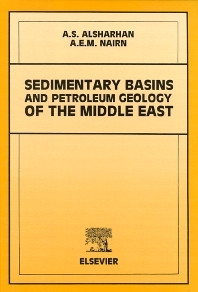 This book reviews the tectonic and geological history of the Middle East and the regional hydrocarbon potential on a country by country basis in the context of current ideas developed through seismic and sequence stratigraphy and incorporating the ideas of global sea level change. Subsurface data have been used as much as possible to amplify the descriptions. The paleogeographic approach provides a means to view the area as a whole. While the country by country approach inevitably leads to some repetition, it enhances the value of the volume as a teaching tool and underlines some of the changing lithologies within formations carrying the same name. For those interested in the geology of the Middle East in industry and academia. Chapter headings and selected papers: An Introductory Overview. Geographic and geomorphologic setting. Geologic setting. Sequence stratigraphy. The Geological History and Structural Elements of the Middle East. Introduction. Geological history. Main structural elements. Discussion. Infracambrian of the Middle East. Introduction. Stratigraphy of infracambrian rocks in Oman. Comparison of the Huqf group with other outcrops in Oman. Comparison of Oman with other outcrops in the Middle East. Paleogeography and geologic history of the infracambrian. The Early Paleozoic Quiescent Phase in the Middle East: The Sauk Cycle and the Early Part of the Tippecanoe Cycle. Introduction. The early paleozoic of Oman. The early paleozoic of northern Saudi Arabia and Jordan. The early paleozoic sequence in southeast Turkey and Syria. The early paleozoic of Iran. Paleogeography and geologic history of the early paleozoic. The Early-Late Paleozoic of the Middle East: The Kaskaskia Cycle. Introduction. The kaskaskia cycle in the Middle East. Paleogeography and geologic history of the late paleozoic kaskaskia cycle. The End of the Paleozoic and the Early Mesozoic of the Middle East: The Absaroka Cycle. The lower part of the absaroka cycle (latest carboniferous-permian). The paleozoic part of the absaroka cycle. The Late Mesozoic Part of the Zuni Cycle in the Middle East: The Jurassic. Introduction. The Jurassic section in central Arabia. The Jurassic section in southern and southwestern Arabia: The Republic of Yemen. The Jurassic section in eastern Arabia. The Jurassic section in extreme eastern Arabia: Oman. The Jurassic section on the eastern side of the Arabian Gulf: southwestern Iran. The Jurassic section in northeastern Arabia. The Jurassic section in northwestern and northern Arabian platform. Jurassic paleogeography and geologic history. The Late Mesozoic Part of the Zuni Cycle in the Middle East: The Cretaceous. Introduction. The first cycle: the early cretaceous. The second cycle: the mid-cretaceous. The third cycle: the late cretaceous. Late cretaceous in western and northwestern Arabian Gulf. Late cretaceous in central and southwestern Arabia. Late cretaceous in the northern Arabian platform. The Latest Part of the Zuni and Tejas Cycles of the Middle East: The Cenozoic. Introduction. The paleogene of the Middle East. The neogene of the Middle East. Cenozoic paleogeography and geologic history. Hydrocarbon Habitat of the Middle East. Introduction. Surface oil and gas seeps. History of exploration. Current status of Middle East oil. Potential plays. Hydrocarbon Habitat of the Greater Arabian Basin. Introduction. Kuwait and the Kuwait-Saudi Arabia neutral zone. Bahrain. Qatar. United Arab Emirates. Jordan. Saudi Arabia. Yemen. The Hydrocarbon Habitat of the Zagros Basin. Introduction. Southeast Turkey. Syria. Iraq. Iran. The Hydrocarbon Habitat of the Oman Basin. Introduction. The Oman sedimentary basin. Index.